To encrypt a message, you must have a key. This key can be a word, a sentence, or a paragraph. For this example, the key will be “TFTC”. You then take your message which for this example will be “GEOCACHE”. Look at the chart you see below. You will be mainly focused on the top row, and the left column. Follow the top row to find the first letter of your message, then go down the left column to find the first letter of your key. Follow that row and column to the point where they intersect. 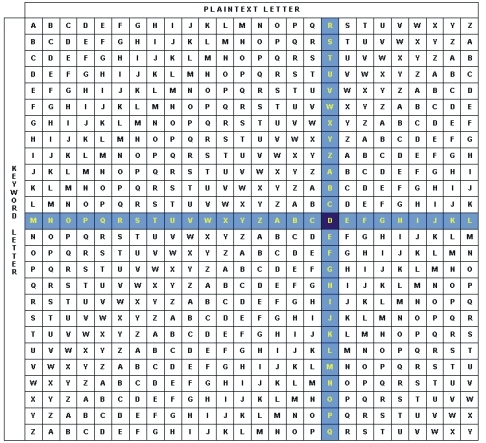 The letter at the intersection is the first letter of your encrypted message. In this case, the first letter of my encrypted message is “Z”. Then go to the second letters of the message and key and do the same thing. This time I follow the E in the top row down to where it meets with the F from the left column. The second letter of my encrypted message is “J”. If you reach the last letter of the key before you reach the last letter of the message, just go back to the first letter of the key. I keep doing this and the full encrypted message is “ZJHETHAG”. This is a high muggle area on nice days so I recommend using discretion when deciding whether or not to attempt to retrieve the cache.